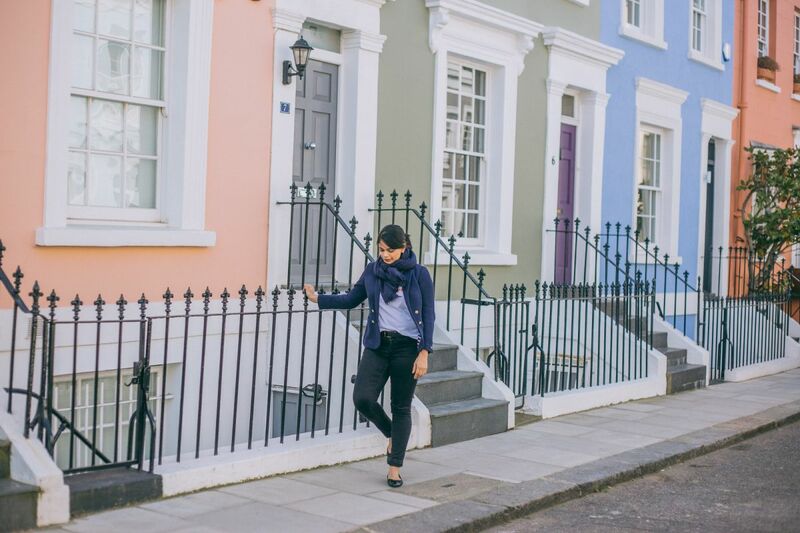 Only when I moved to the UK did I ever make the effort to even get dressed for a quick errand. I remember the days back at university, I would schlepp it to my 10am class in sweats of leggings even. Raise your hands high and proud if you owned the gilet, messy bun, college hoodie and leggings look. Raising high and raising proud! Now my life has taken this weird turn where a quick nip to the store means I grab a matching handbag and put on a pair of flats. See how I used nip there? Everyone outside of the United States supposedly got the memo about “no sweats in public” and I’m (mostly) here for it. One thing I’ve done is have a go-to “I don’t feel like it” outfit. One that is put together enough, yet comfortable. Effortless and chic. Meet the tee and jeans! Add on a slogan to that tee and you’ve got yourself a classically fashion forward outfit with jeans. 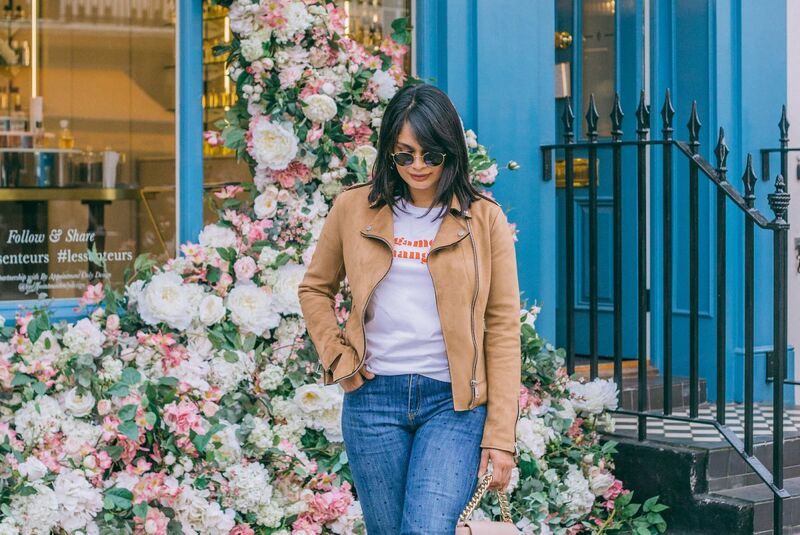 Since so many blogs and Instagram accounts are giving you the right inspiration when it comes to styling a slogan tee, I thought I would share three ways I style a slogan tee and jeans. 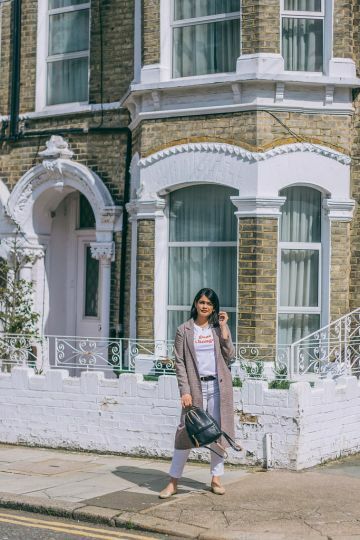 I thought I would share three ways because you all seemed to have really enjoyed when I shared how to wear a grey blazer! 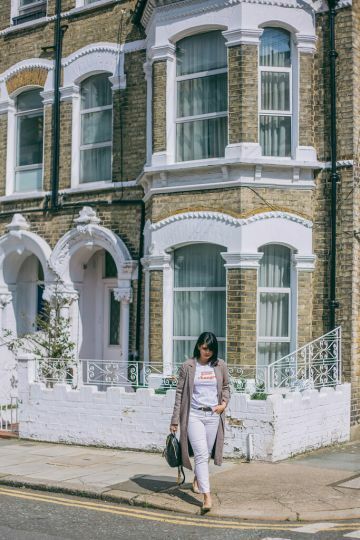 If you’re not too into the trends, a simple slogan tee is the best way to elevate a wardrobe. I loved styling my Baukjen slogan tee because it’s more than just trendy, it’s impactful. 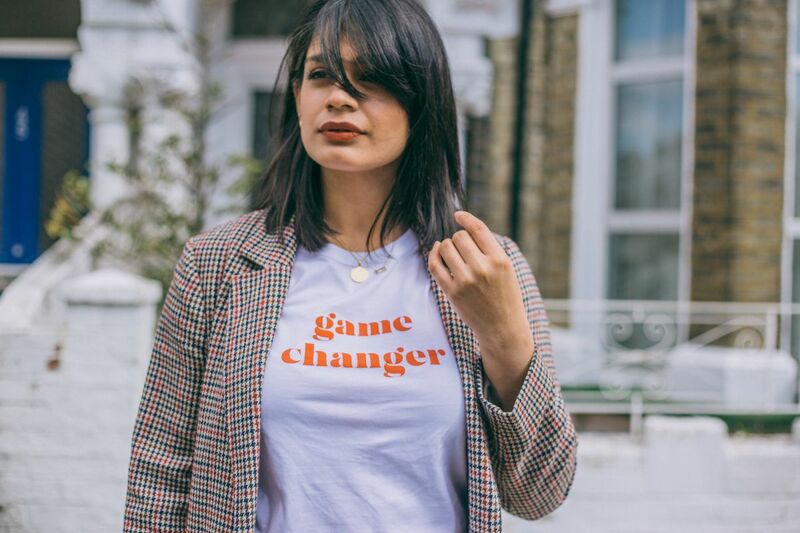 This Baukjen slogan tee is designed to support The Diana Award’s three key programmes for young people, including; anti-bullying, mentoring with focusing on driving change for young people. 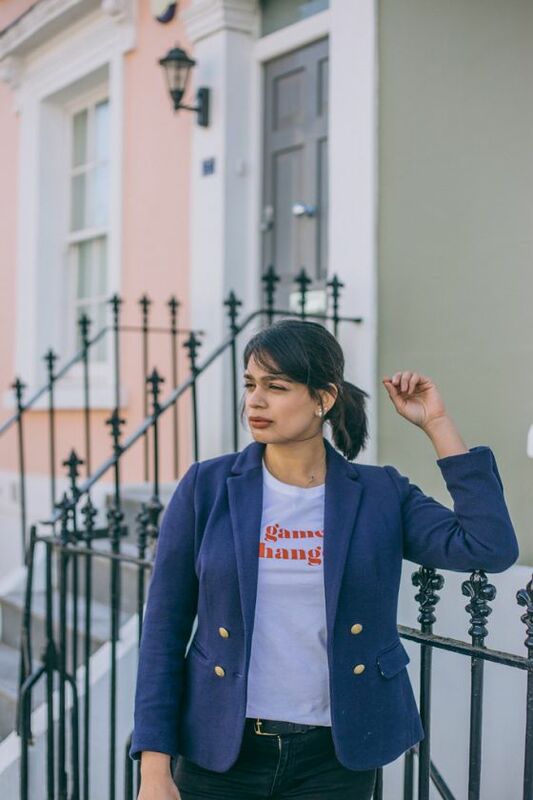 Launching throughout the year as part of the SS19 collection, the t-shirts are all named after young Diana Award ambassadors, and 50% of net proceeds from sales of the tee’s will be donated to the Diana Award. 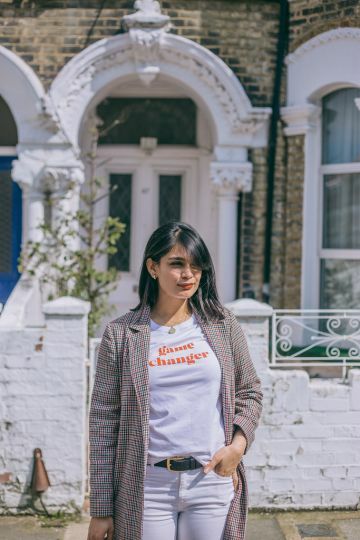 My Angel ‘Game Changer’ slogan tee is named after 15 year old Angel Hemmings, a Diana Award Holder who has unlimited passion for improving mental health awareness. 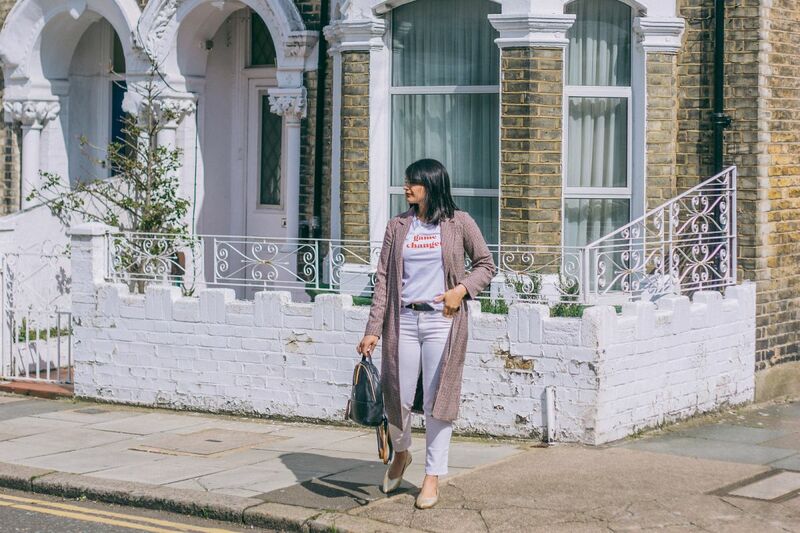 The first way I styled my slogan tee and jeans is perfect for an afternoon of errands. I go for a super soft denim in the same color as the tee for a monochrome look. My white jeans have a little room and throw on a large check coat on top to add a bit of texture and help bring everything together. To stop myself from looking a bit too edgy, I throw on some delicate gold necklaces, simple earrings and maybe a deep red lip color if I’ve got makeup on. My errands are everything form running to the bank, dropping off a parcel at the post office to picking up some dinner ingredients. A small sized backpack is the perfect accompaniment to carry all the essentials. I love that the French dress so effortlessly. 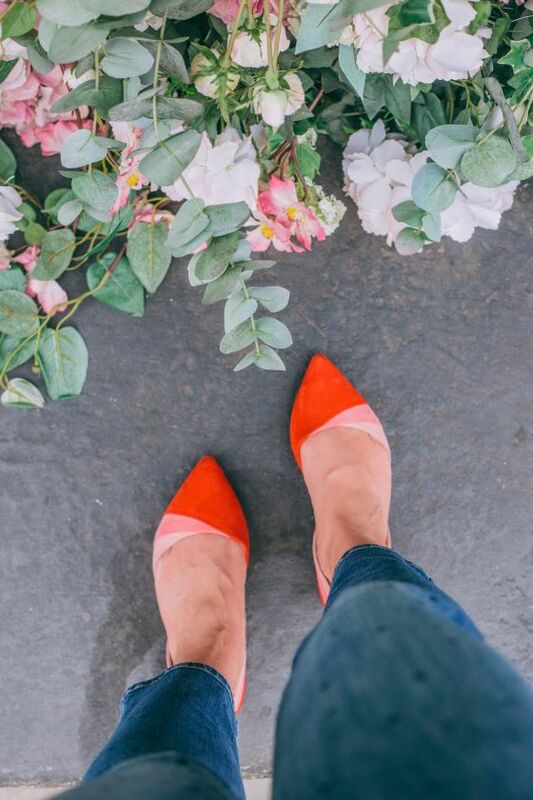 They go for classics that are not too trendy, simple colors and very practical. I think it was during the Paris Fashion Week street style shots did I see someone style a slogan tee and jeans with a blazer and matching (note: not complimentary) scarf. I loved how simple it was. One of my favorite combos is a navy day blazer with chunky buttons and black skinny jeans. 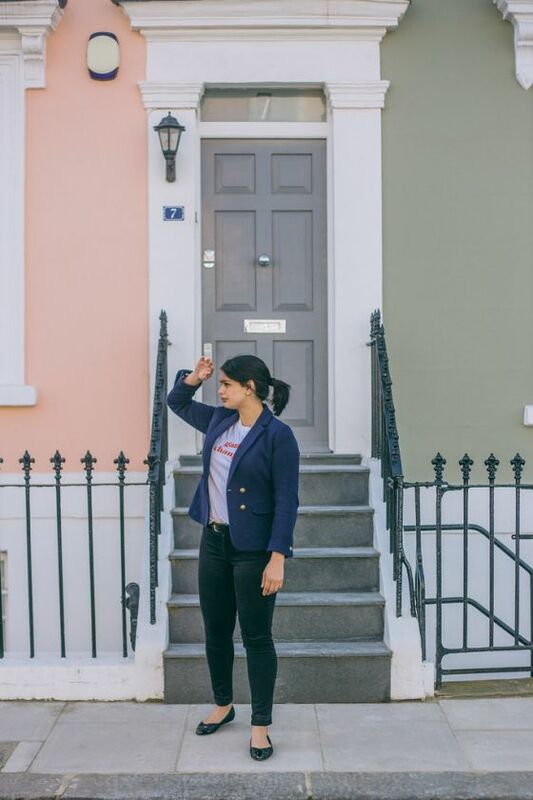 The buttons on the blazer really help lift the outfit and even though the rest of the outfit is incredibly simple, it really makes my slogan tee pop. Weekends are another time where I just can’t give when it comes to dressing up. I usually aim for the same sneakers and layer up to just feel like I’m still in bed. I paired my slogan tee with a fun subtle polka dot print jeans! The jeans have a bit of a polka dot pattern on them and it really makes a very simple outfit look cool. 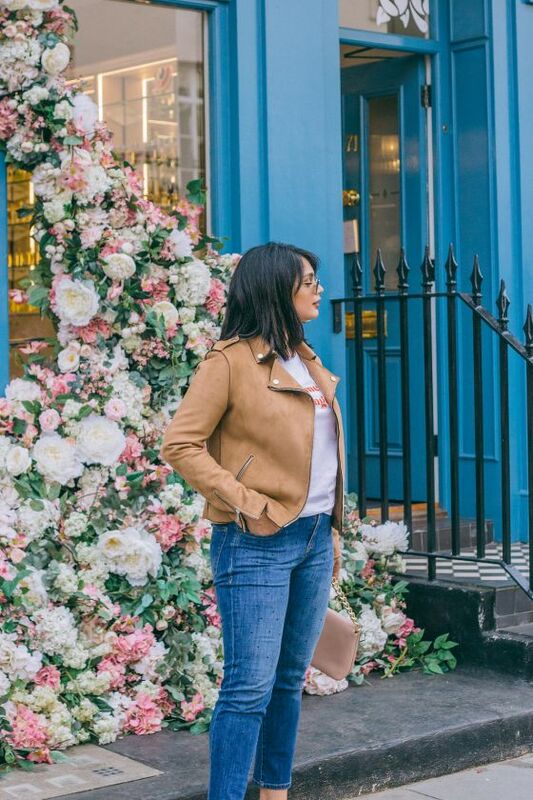 Paired with a biker suede jacket, it is one jacket I have in my closet that is always best to wear during transitional weather. 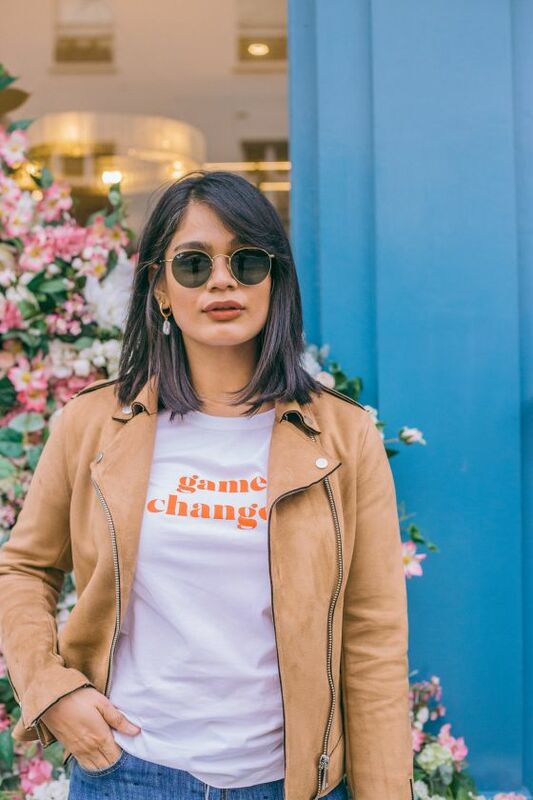 Go for some cool sunglasses like the Ray-Ban sunnies that never faile me and a pair of flats that match your slogan tee, so it helps people notice it. 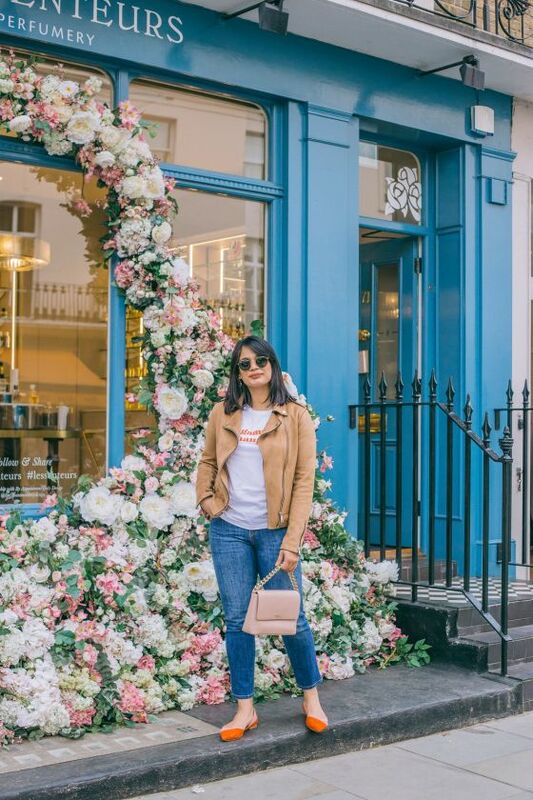 The perfect weekender in the city for some coffee dates or brunch plans! So what do you say? Would you try a slogan tee? Have you worn one? Or better yet, are you currently wearing a slogan tee and jeans?